Friends, welcome to the 9th issue of our Newsletter. 2018 was a very busy and exciting year for the MST. Our new CRM database and CMS website both went live. They are still “work in progress” and you can expect to see additions and improvements early in the New Year. I am pleased to report that we continue to locate and identify scrolls that were lost, went missing or communities no longer remembered they had a Czech scroll loaned to them. For this reason alone, our Czech Torah webpage project which now has 353 links, is of vital importance. If your community has not yet added a Czech Torah page to your website, I hope that you will soon do so. Please contact me if you have any questions or require help with this. Our goal is to link over 1000 scroll-holders around the world, so we need your help. This year I attended a siyum in Dartmouth MA, a hachnasat in Potomac MD, presented a Certificate of Recognition in Slavkov, and attended special services in the UK. In February I shall be in New York for the Temple Emanu-el Czech scroll-gathering, the first of its kind in Manhattan that promises to attract over 50 scrolls and hundreds of attendees. We remember the tragedies that took place during the past year. As well as the horrific events caused by mankind, also infernos to tsunamis created by nature that resulted in so much death and destruction to the those caused so cruelly and needlessly by mankind. I hope and pray that 2019 will be a year of peace in which there will be more respect, tolerance and understanding in the world. PS We publish many short articles and Czech Scroll Museum visitor pictures on our Facebook page - please click Facebook Like to keep in touch with us. 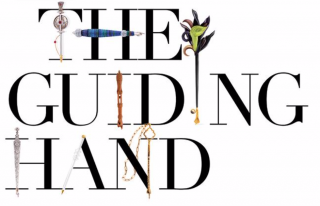 On the evening of Tuesday, February 5, 2019 the Herbert & Eileen Bernard Museum at Temple Emanu-El in New York will open its Spring 2019 exhibition The Guiding Hand, Torah Pointers Past and Present. To mark the opening of this exhibition, Temple Emanu-El’s Bernard Museum, in partnership with the Memorial Scrolls Trust (MST) of London, will be hosting a gathering of Czech scrolls which survived the Holocaust. This will be the first gathering of this type in New York City. We hope that you will bring your MST scroll and a group of interested congregants to participate in a procession of the scrolls, a discussion of the exhibition and a visit to the museum. For thousands of years, Jews used simple tapered wooden sticks to point the way through the densely written text of the Torah without touching the fragile parchment. But over the millennia, the yad — pointer — has developed into a unique art form. While some yads are still carved out of wood, others are now shaped from silver or graphite, and even ornamented with gold, ivory and jewels. The yad has thus become an artistic chronicle of how Jews read and relate to the Torah, a story you can explore in a wide-ranging exhibition of more than 200 pointers of all styles and national origins, some up to 400 years old. The display draws from private collections, including that of the Barr Foundation and will also feature Torah ornaments belonging to the Bernard Museum of Judaica at Temple Emanu-El. It will be a truly powerful and memorable experience to be surrounded by dozens of Czech survivor scrolls held by their proud custodians. The Czech Torah scroll at Temple Beth Israel in Pomona holds a place of reverence in the congregation’s hearts. In 1983, five b’nai mitzvah families, the Ambroses, Joneses, Lawrences, Selznicks and Shaletts, banded together to sponsor its adoption through the Memorial Scrolls Trust. Memorial Scrolls Trust’s letter of transfer dates this scroll to the mid-19th century, and identifies it as one of three from the Tábor Synagogue, but it’s not clear whether it was from Tábor or was brought there on the way to Prague. Like many other rescued scrolls, TBI’s Czech Torah was quite fragile and deemed pasul, too damaged to restore to kosher status for reading. The Czech Torah quickly became an integral part of all the b’nai mitzvah services. “We talk about its history and each bar or bat mitzvah carries it through the sanctuary before switching to a kosher Torah scroll for reading,” says Rabbi Jonathan Kupetz. Because of its fragility, it’s opened for viewing only on special occasions such as the anniversary of its dedication. As he and Cantor Buch explain, nearly everything about this scroll is unusual. The Czech scroll is the tallest scroll in the ark, yet it’s the lightest. The wooden rollers are very light, the parchment itself is thin enough to see your hand through, and the columns are very wide, so the scribe used fewer sheets of parchment. “But as far as we can tell, it is complete,” Buch says. Rabbi Kupetz lifts the Czech Torah out to show the dedication plaque underneath and brushes off some black dusty bits. “The black is actually ink that comes off the scroll,” he grimaces. He and Cantor Buch lay the huge scroll on top of the grand piano as gently as possible and unroll it. Inside, one parchment section is mostly sharp and clear, but the next one’s letters are faded hollow where the ink is cracking off, and some whole letters have disappeared, leaving yellow ghosts. But restoring it to kosher status would have meant replacing nearly all of the original parchment, wiping out most of its character and history in the process. This Torah has further secrets to reveal. Cantor Buch and Rabbi Kupetz quickly get caught up pointing out unusual features. It’s not a “vav” scroll--the modern Ashkenazi standard starts most columns with that letter—so it’s almost certainly over 100 years old. The columns are as wide as a sheet of typing paper. It’s too big to fit into a Sephardic Torah case and the letters are mostly standard Ashkenazi script, but many are missing their tagin or crowns, and others are genuinely odd. In addition to the familiar stretched and compressed letters, some older scrolls contain otiyot l’fufot—curlicued nonstandard letters and decorations. Sometimes they identify a particular scribe, but more often they highlight a message or local tradition. Joshua tells his brothers that G-d will take notice and redeem them out of Egypt, and to take his bones with them back to Israel. An old tradition links the two by inferring that Joseph repeated pakod yikod as a secret password by which the Israelites would recognize the person sent by G-d to deliver them from slavery. Susan Boyer, the Trust’s US curator, explains that in most places, the Nazis just destroyed Torah scrolls and ritual objects, but in Bohemia and Moravia, archivists from the Jewish Museum of Prague convinced someone in power to let them store and catalog these objects centrally. “I think in the early years the Czech Jewish community didn’t realize how bad it was going to get,” she says. Jews were conscripted to record community names for each Torah, but their efforts to save the scrolls did not save their lives for long, and only two survived the camps. In Tábor, the desecrated Jewish cemetery became a park and the synagogue was a warehouse until 1977, when it was torn down for a parking lot with a memorial plaque. The scrolls sat abandoned for years. In the early 1960s, the new Communist government, strapped for cash, tried to sell them to Israel, which refused, stating the Czechs should donate them as reparations. 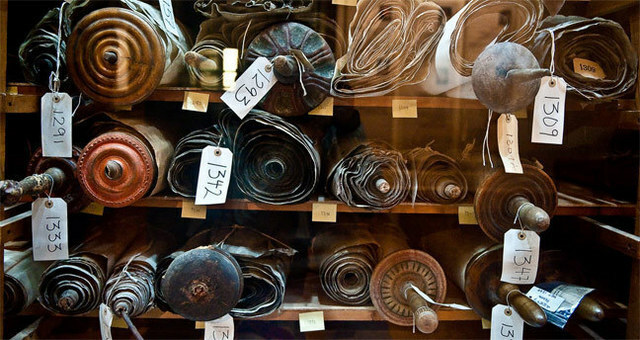 Then in 1963, London philanthropist Ralph Yablon bought all 1564 scrolls and brought them by train to the newly-formed Westminster Synagogue for safekeeping and restoration. 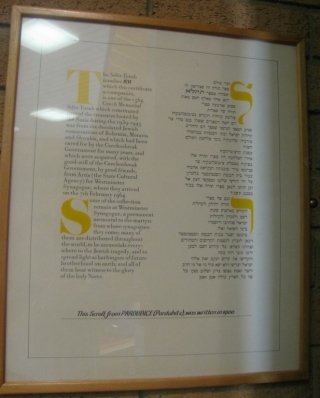 The congregation formed the Memorial Scrolls Trust and hired a sofer, David Brand, to inspect and repair the scrolls. It became his life’s work. Ruth Shaffer, a synagogue member, was the Trust’s archivist for over 40 years, and in her eighties she learned how to use a computer to update the catalog from index cards. Since 1964, the Memorial Scrolls Trust has distributed Torahs on permanent loan to communities worldwide, more than 1000 in the US and over 100 in Southern California. If a participant closes its doors, the scrolls must be returned, though, as Boyer and Ohrenstein point out, some communities have forgotten their scrolls’ origins after decades, and one actually brought theirs to Israel for burial. Today Boyer helps the Trust track them, connect participants online and give local communities more appreciation for the scrolls in their care. 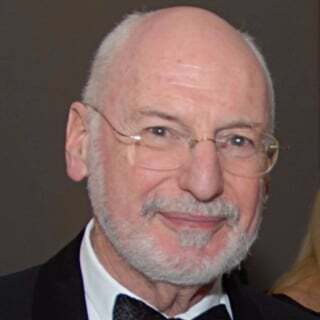 Don Bloch, who has also visited Westminster Synagogue, has represented TBI at two Czech Torah reunion events with other congregations at Leo Baeck Temple and the LA Holocaust Museum. The loans carry one more responsibility, Lawrence says. “If a temple is ever erected in the town of Tábor, our Torah gets shipped back to them. I always say it would be my greatest pleasure to take it back. Deborah Noble, author and photographer, published this article in the November 2018 issue of JLife-SGPV. The Jewish Federation of the San Gabriel and Pomona Valleys (www.jewishsgpv.org). Those who frequented the Gershman Y over the past few decades may have noticed a Torah scroll in a glass case. 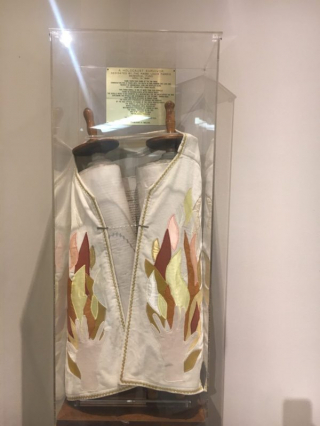 The scroll was on long-term loan to the Y from the Memorial Scrolls Trust, a London-based organization that lends Torahs from a collection of more than 1,000 that survived the Holocaust. This particular scroll, known as MST#1120, has led a perilous life. It has outlived the Holocaust, communism and the ebbs and flows of changing Jewish life in the United States. It has traveled the world from the former Czechoslovakia, to England and finally to the Gershman Y. And after the community center’s closing at the end of November, MST#1120 has a new future at the Jewish Day School of the Lehigh Valley in Allentown. The scroll’s known history dates to 1942, when Jewish communities across Bohemia and Moravia, part of what was then Czechoslovakia, received a letter urging them to send everything they had — their Torah scrolls, gold and silver, even the mohel’s knife — to the Jewish Museum in Prague. More than 100 Jewish communities in Bohemia and Moravia sent their possessions. One was Přerov, which sent MST#1120. More than 212,000 items were sent to the museum, which expanded by 14 times. More than 40 warehouses were needed to store all of it. Nazis had Jews catalogue these treasures. When they were finished with the work, Nazis sent the Jews to concentration camps, where most of them died. But the vast collection survived, including about 1,800 Torah scrolls. For decades, a myth pervaded that the Nazis had collected these items for an eventual museum to the Jewish race, but no proof has been unearthed. No one knows the true reason why the Nazis put the collection together. Memorial Scrolls Trustee Jeffrey Ohrenstein said his theory is that the Nazis wanted to know the value of the possessions and planned to take what they wanted from the collection. MST#1120 originally came from the former Czechoslovakia. In February of 1948, communists took over the region. They moved the Torah scrolls into a damp warehouse, which had once housed a synagogue. The scrolls remained there for nearly 20 years. In 1963, the government-controlled Artia company approached art dealer Eric Estorick about buying the collection of scrolls. He discussed it with a client, Ralph Yablon, who discussed it with Westminster Synagogue Rabbi Harold Reinhart. In the end, they decided to buy the 1,564 scrolls that remained. They spent those first few months examining them and deciding which ones were kosher, which could be repaired and which could only be used as a memorial. In the summer of 1983, a letter arrived at Westminster Synagogue. Like the letter that had arrived from the Jewish Museum in Prague so many decades before, it marked a new chapter for MST#1120, but one that would be much brighter. The letter was from Albert L. Pollock, then the vice president of the Congregation of the Young Men’s and Young Women’s Hebrew Association, now known as the Gershman Y. In the letter, he made a request for a Torah. The deal was made. MST#1120 found a new home at the Gershman Y. It remained there for more than 30 years, until the end of November. With the impending closure of the Gershman Y, Ohrenstein reached out to Charles Ticho, a 91-year-old Holocaust survivor who has been involved in the organization. Ohrenstein asked him if he would pick up MST#1120. Ticho’s family had connections to the Jewish day school, and he and his son Ron Ticho decided they would provide the support needed so the Torah would be moved to the school. “These are tangible items that represent, not just the fact that there are Torah scrolls, but they are, in effect, a memorial to the Jews of that particular town from which they came,” Charles Ticho said. It all happened quickly. In November, Golding learned the Torah was available, and submitted an application right away. On Nov. 28, Ron Ticho, his daughter and friend Larry Lang went to the Gershman Y to pick up the Torah and make the drive to Allentown. The day it arrived at the school, students were preparing for Chanukah. It was also just before the community’s 65th gala, when they would celebrate a family whose matriarch had, like MST#1120, survived the Holocaust in Czechoslovakia. It was then that Golding received a text that the Torah was 10 minutes away. The school is working to create an openable case for it so the Torah can both be put on display in the lobby and be taken out on Yom Hashoah and other occasions. In addition, the students will be working on different ongoing projects with the Torah. Even in the darkened ark. Silently wait for their moment. To the waiting reading table. From abuse, years of neglect. Letters faded, the ink dimmed. The holy text no longer intact. You are not alone; we honor you. With deference we look at you. To cling to our faith - not to forget. Know: You and we will survive!